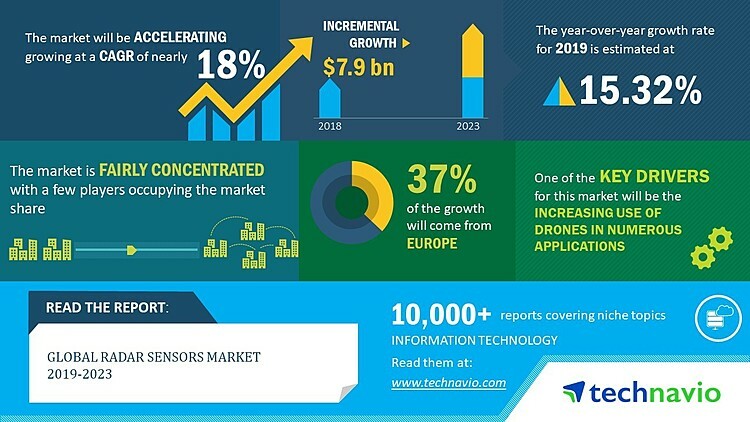 LONDON--(BUSINESS WIRE)--Apr 15, 2019--The global radar sensors market 2019-2023 is expected to post a CAGR of nearly 18% during the forecast period, according to the latest market research report by Technavio. Sensor fusion technology collects information from various sensors and the AI processing system decides the action to be taken based on the collected information. The technology is being adopted in the automotive sector to improve safety. OEMs are collaborating with camera manufacturers to develop and integrate radar sensors into a single module in a vehicle. The integration of such sensors collects raw information and advice the vehicle’s control unit. For instance, Tram builder PK Transportnye Systemy partnered with Cognitive Technologies to develop a tram integrated with cameras and sensors to process raw data. The cameras integrated with radar sensors can recognize objects with high accuracy. Furthermore, these systems are being increasingly adopted in most of the vehicles. The trend of fusing radar and image sensors helps in cost reduction and is expected to fuel the growth of the market. “ Autonomous cars incorporate various sensors such as radars for its operation. Honda Motor recently announced its plans to invest in General Motors Co’s Cruise self-driving vehicle. One of the leading automobile manufacturers, Daimler, announced a partnership with Robert Bosch to develop autonomous vehicles. Increased investments in autonomous vehicles that require radar sensors will drive the growth of the global radar sensors market over the forecast period ”, says an analyst at Technavio.